These DIY black and white invitations and favors are deliciously pretty. The filigree birdcage and the two love birds have a touch of French frou frou! Use pure Black and White or add a bright color, or print on colored paper. These printable designs are very ink-saving and the range has a basic and favor set included. Easy to make yourself! Just add your text to the JPG files - or let me do it as a service. • Two pattern pages in Bird and Birdcage designs. please contact me for details and a pay button for $29.99. Black and White invitations, favors, elements and pattern pages are easy to use and are professionally designed by Anni Arts for the budget-conscious bride! 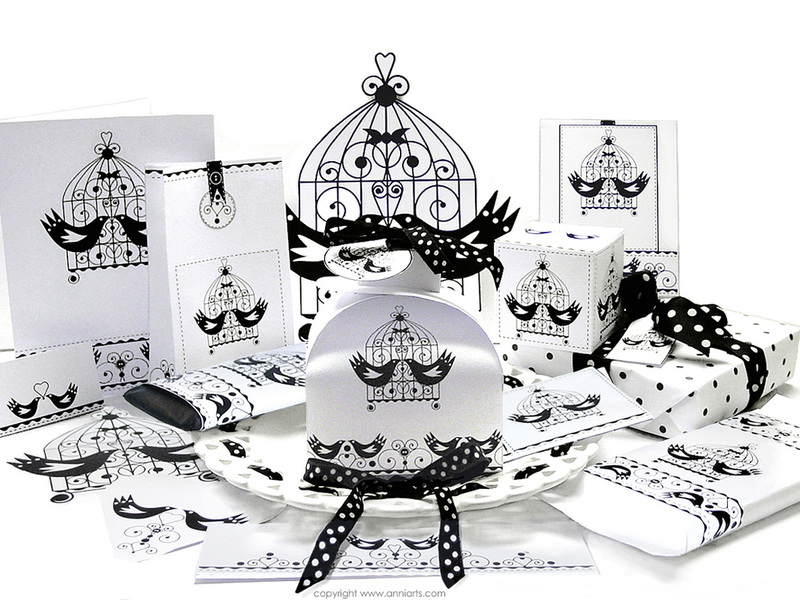 The set has Black and White invitations, table items, ten favors and extra bridal stationery. It is a versatile basic set that coordinates beautifully with many wedding styles and colors accents.